This umbrella depicts a tattooed, raven-haired fairy staring deeply into a moonlit pool. As butterflies flutter nearby, her hand reaches towards a skull just under the surface. A piece that is perfect for projecting an air of mystery and wonder, and is sure to make you stand out from the crowd on a rainy day. Featuring the "Immortal Flight" artwork in 3D by the amazing Anne Stokes this evening bag will be su.. 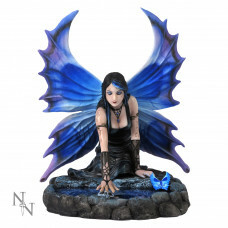 This alternative Fairy figurine comes from the Gothic imagination of world-famous Fantasy artist Ann..